Get to know our GPO! The Giant Pacific Octopus (GPO) is one of the highlights of our Hall of Fishes. Native to coastal regions from Korea and Japan to the Pacific Northwest, and growing up to 15 feet across, this charismatic species quickly becomes a guest and staff favorite. Octopus are incredibly intelligent creatures. Our Giant Pacific Octopus recognizes her caretakers by sight and smell, knows how to solve puzzles, open jars, and enjoys interacting with guests. Their big brains — nine in total, one central brain and then smaller brains that help control each of its eight arms —make captive octopus escape artists. We use artificial turf to keep our girl in her enclosure as her suction cups cannot hold or grip the turf to pull herself out. Considered to be a master of disguise, the Giant Pacific Octopus can blend expertly into its surroundings and communicate through color by using a complex system of muscles and pigment cells called chromatophores. They can change both the color and texture of their skin, helping to ambush prey or hide from predators like sea lions. They assess their surroundings using their sharp eyesight then expertly blend in. What makes this skill even more amazing? Octopus are believed to be colorblind. The Giant Pacific Octopus are typically a reddish color, but fade to light pink or a marbled pink and red color when they are relaxed or sleeping. They tend to be lighter on the underside of their arms. Its eight long arms are covered in 2,240 suction cups that are used to grip, taste, and smell. Each suction cup has more taste receptors than the human tongue. Giant Pacific Octopus typically live alone in a home range. They leave their protective dens to hunt for crabs, abalone, fish and other invertebrates in the cool waters they call home. Giant Pacific Octopus typically only come together to mate near the end of their short 3-year lives. A female Giant Pacific Octopus will lay up to 74,000 eggs in strands that she hangs along the walls of her den. The mother will then spend up to 7 months in the wild, and sometimes longer when in captivity, protecting and taking care of her eggs. She will blow gentle streams of nutrient and oxygen-rich water over the eggs using her syphon, and will sometimes fan them with her arms. Mother octopus do not eat during this time, and the dedication to their young costs them their lives. She will usually die shortly after her eggs hatch. Octopus are mollusks – meaning they are boneless invertebrates that are related to snails and clams. Octopus are part of the Cephalopod class, with their closest cousins being squid, cuttlefish, and nautilus. Cephalopods of all sizes and shapes are known for their intelligence and unique arms and tentacles. They have been around since before the dinosaurs and have survived many mass extinctions to shape the oceans we know today. Join us for Cephalopod Celebration on October 20-22, 2018! 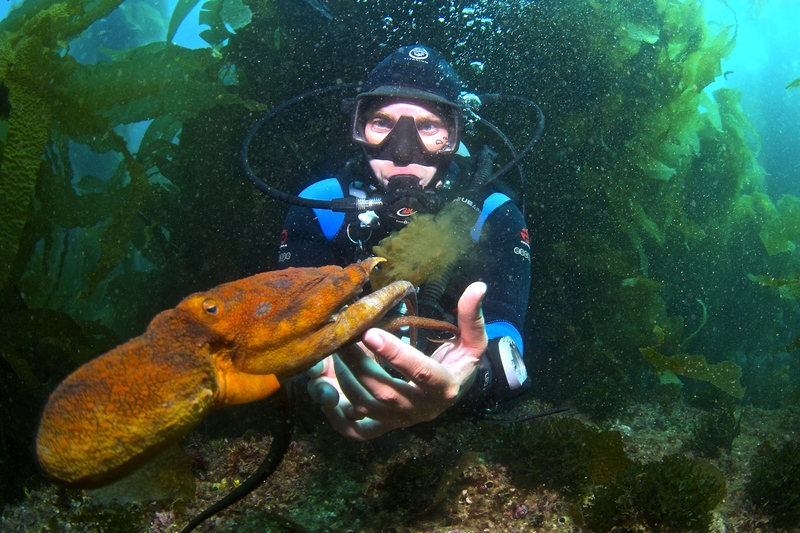 There will be a weekend of cephalo-tastic activities for the whole family, storytimes and author events, and special guest scientists from Scripps Institution of Oceanography. Hope to see you there!